Temple of Abidos, Egypt. 19th.Dynasty 1317 B.C. 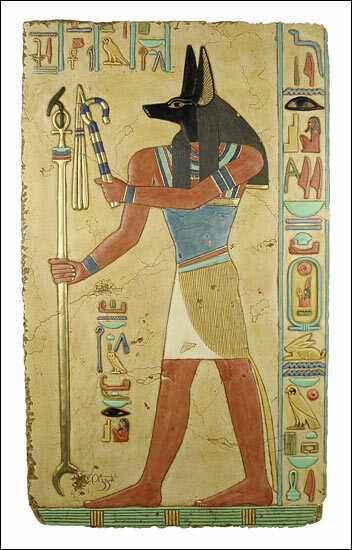 Anubis, God of the Dead, represented with a head of a jackal or simply as a jackal opened the road to the other world and presided over embalmments. After a funeral, Anubis would take the deceased by the hand and introduce him into the presence of the sovereign judges where the soul of the deceased would be weighed. Anubis was the Guardian of Offerings brought to the ceremony by heirs of the deceased and he also guarded the mummy from evil forces in the night. When the body was embalmed, a priest wearing a jackal mask acted as Anubis's representative. He also was the guardian of the Sacred Esoteric Mysteries. The origin of this God lay in the fact that jackals could be heard howling in the desert to the west of the Nile at sunset-at the time when burials took place. Here, Anubis is shown carrying the long �was� scepter and the crook and flail, symbols of kingship.